Diamond Technology Solutions offers the most advanced B2B (Business-to-Business) and B2C (Business-to-Consumer) Online Diamond Inventory and Sales tool powered by our Odin© platform. 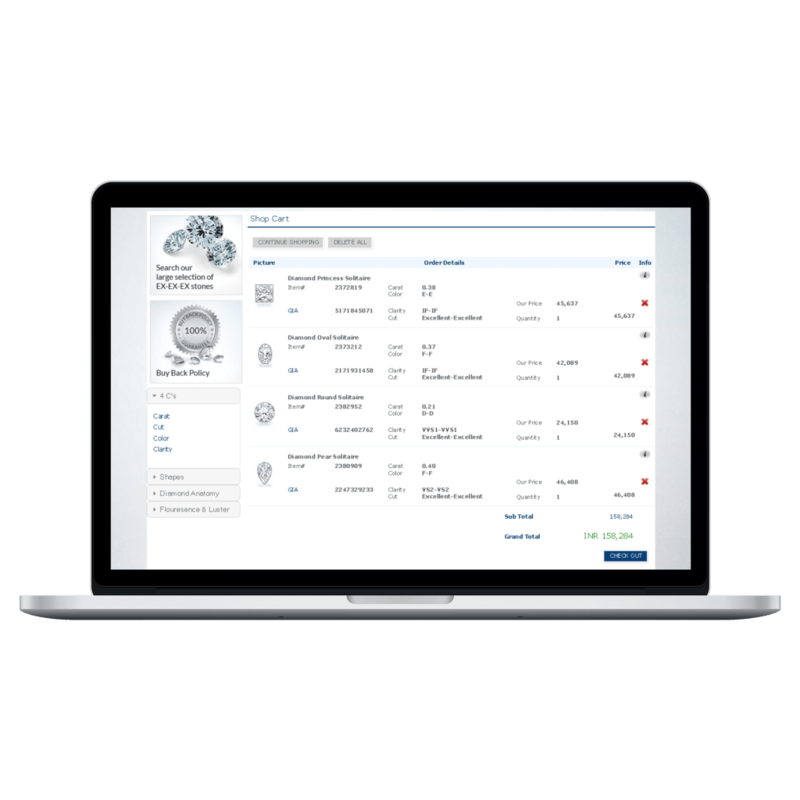 It allows your customers to search your inventory, post requirements, place orders and even make payments online while providing you with a robust diamond inventory management tool accessible at anytime-anywhere. 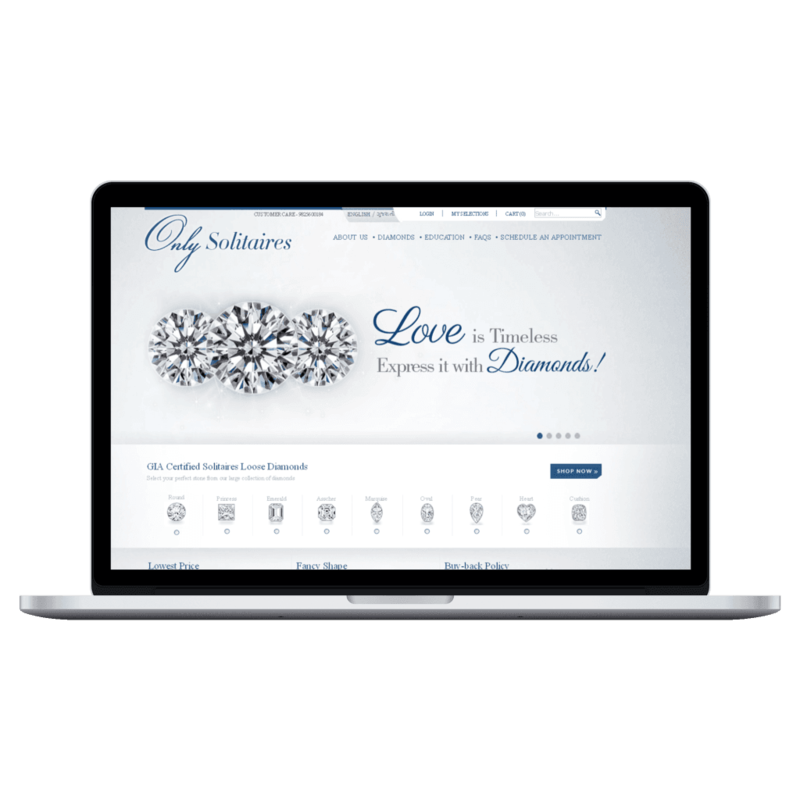 Our web application allows customized development with software integration as well as a custom website design for your diamond company. 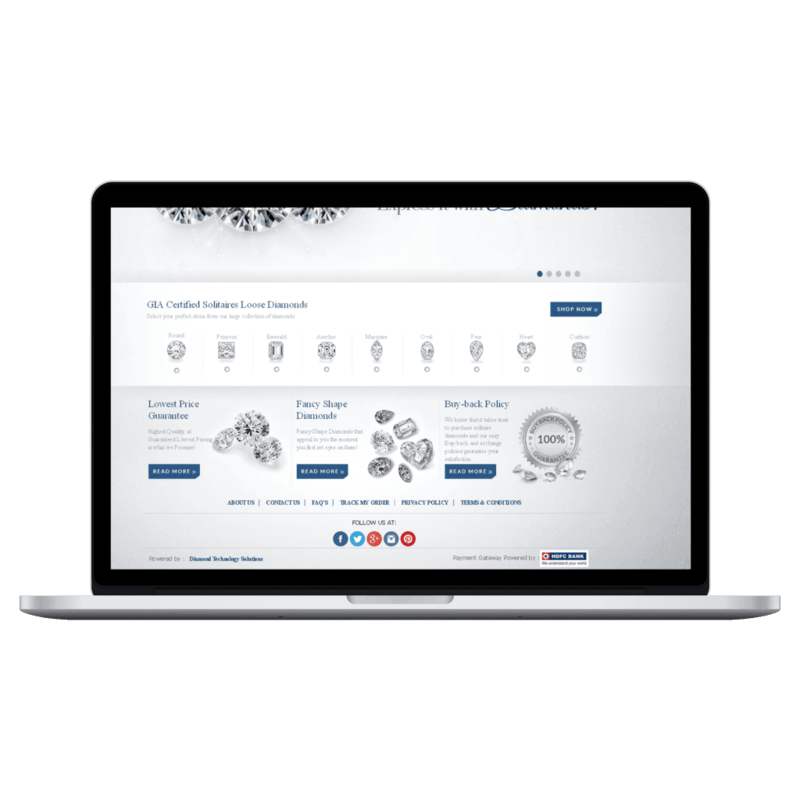 With a Rich User Interface, Robust Software Technologies and Innovative Ideas, it allows Diamond Manufacturers and Wholesalers to take a leap into the dot-com world. Diamond Technology Solutions offers the most advanced B2B (Business-to-Business) and B2C (Business-to- Consumer) Enterprise Software and Online Diamond Inventory tools powered by our Odin© platform. Whether you are an independent diamond wholesaler, jewellery retailer or a multi-office diamond manufacturer wholesaler our Odin Software will help you manage all parts of your business including Inventory, Customer Relationships, Vendors, Invoicing, Marketing and Bar-Code / RFID. Our integrated E-Commerce solutions allow your customers to search your inventory, post requirements, place orders and even make payments online while providing you with a robust web-based diamond inventory management tool accessible at anytime-anywhere. Our AJAX powered Diamond Search Tool uses a unique method to rapidly search through thousands of diamonds in the inventory. It has the ability to search through up to 100,000 certified loose diamonds in less than 1.5 seconds being faster than the BlueNile search engine. Your customers can search for certified diamonds by using our Quick and Advanced search functionality. 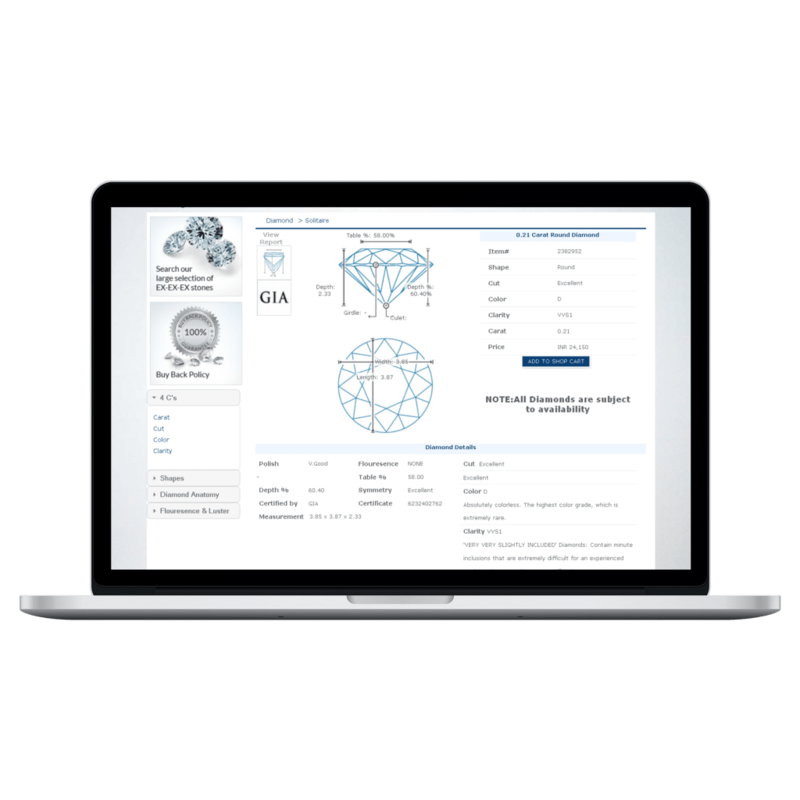 Odin© has been integrated with Rapaport to allow you to calculate diamond prices based on discounts on the Rapaport Pricelist. Finding and selling similar stones is made easy with our Pairs Search Tool allowing you to match your existing Single Stone inventory for creating Matching Pairs. You can also set specific ranges of stones that each of your customers are interested in, and send them diamond stock details for only the stones that match their requirements. Odin© supports inventory management Diamond Parcels / Lots allowing you to specify Sieve Size, MM Size and Carats. 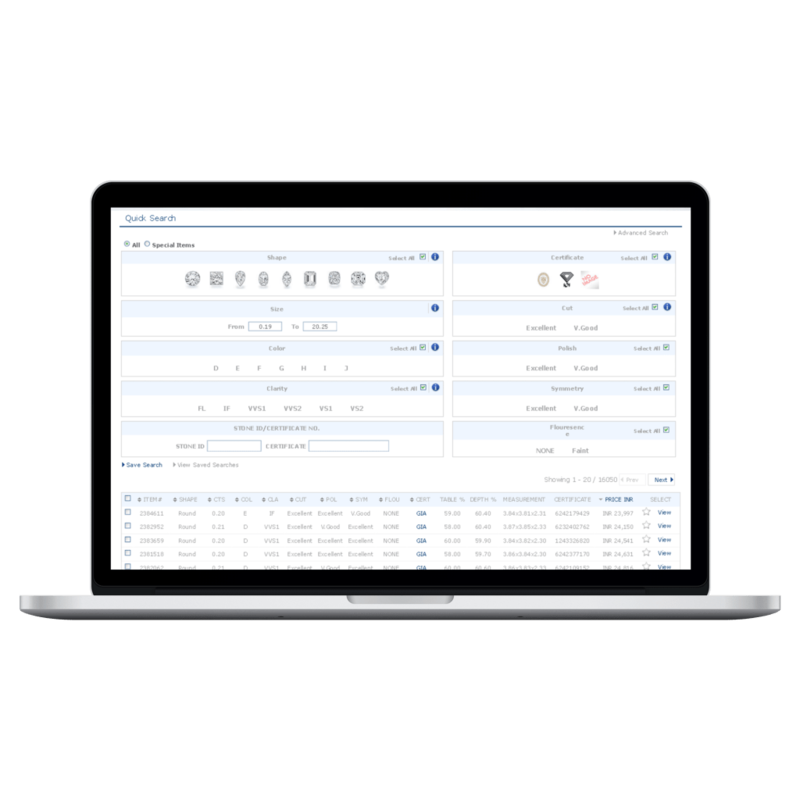 Our Split / Merge feature help you to maintain your loose diamond inventory and maintain average prices with a historical record of the parcels transactions. This module allows people to view your diamond website in different languages. Please note that we do not provide services for translation of content. Translated content must be provided by you. We provide a Tablet web app that is a touch-friendly web-based interface that allows your salesmen to show products within the office or on-the-go and even allows your customers to view your products and place orders. 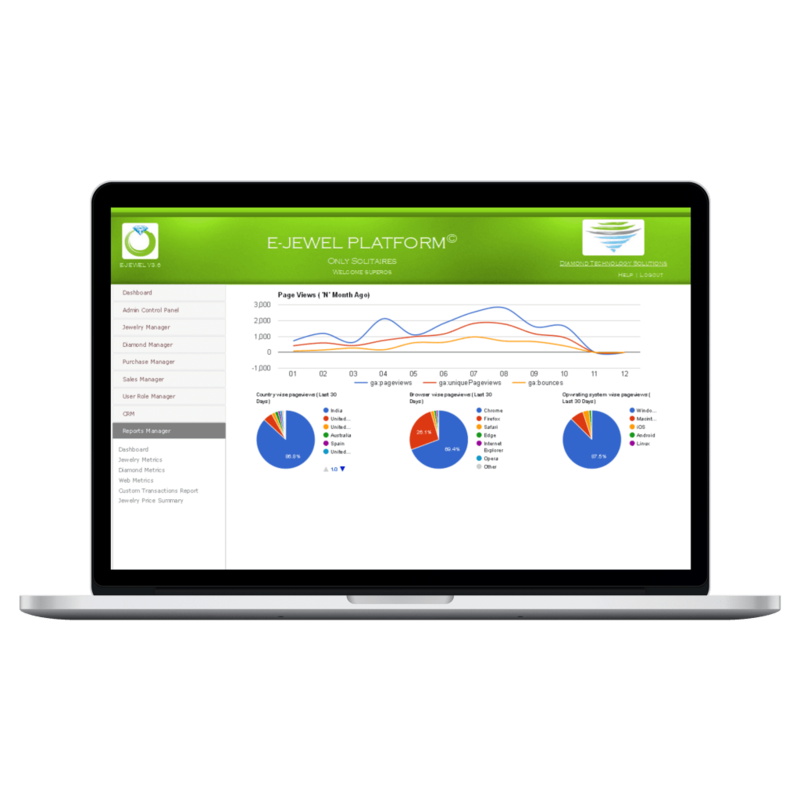 It is fully integrated with the Software and provides real-time product and order data. We offer 7 free templates / themes that can be used on the website that come pre-integrated with the platform at no additional cost. In addition to this, we also offer custom jewellery website design services where we will have one of our designers create a template as per your specifications / preferences. We realize that responsive websites for complex search capabilities required for diamond websites are just not effective. Therefore, we provide an integrated mobile web app that is a touch-friendly mobile website that allows customers to view your products and place orders using a mobile device. It is fully integrated with the E-Commerce website and provides real-time product and order data. We also provide a Facebook App that allows your products to be listed in a Facebook Store on your company Facebook Page. This allows customers to seamlessly purchase your product without ever leaving Facebook. It is fully integrated with the E-Commerce website and provides real-time product and order data. Our Content Management tools allow you to dynamically add or edit content pages using a simple WYSIWYG (“What you see is what you get”) Tool to enter text, images and links using advanced formatting tools. It also allows you to add page titles, meta-tags and other information required for Search Engine Optimization. Our built-in CRM tool allows you to send diamond promotions and newsletters to your customers by Email. 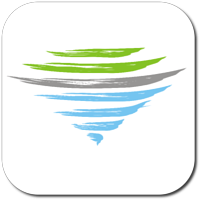 You may also use our newly added SMS Marketing Tool to send news updates. The tools allow you to send personalized emails to your customers using a simple WYSIWYG (“What you see is what you get”) tool.